When ensuring that your hygienic space is safe and secure, it is also important to maintain a vibrant and stylish aesthetic to transform your working environment. Although you may think that it is difficult to implement a hygienic cladding solution that works to effectively inhibit the growth of harmful bacteria as well as maintaining a stylish look, this is not the case. Here at BioClad, our hygienic cladding product PhotoClad can be printed onto your hygienic wall cladding solution, providing you with a modish space that is effective in upholding antimicrobial protection. Why should you choose antimicrobial as your hygienic cladding solution? When it comes to maintaining a safe and secure environment, it is critical to choose the right solution to protect yourself and others in your hygienic space. With that being said, it is important to understand how an antimicrobial solution provides a superior level of protection compared to others. Antimicrobial technology works to kill harmful microbes, including bacteria, mould, fungi and viruses. This, compared to antibacterial solutions that only work to destroy bacteria, highlights just how much more effective investing in antimicrobial is to the hygienic qualities of your space. Here at BioClad, we use BioCote®, a revolutionary product that utilises silver-ion antimicrobial technology to kill microbes by 99.9% in just two hours, thus successfully protecting your working environment. Our products have been proven to be effective against a number of viruses including E.Coli, MRSA and influenza. To find out more about how antimicrobial technology works, read our ‘Antimicrobial Explained’ document. 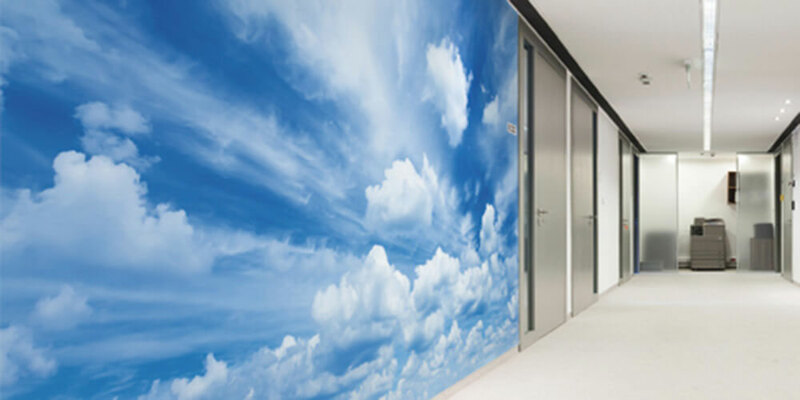 Our innovative digital wall printing service PhotoClad works to transform the look and aesthetic feel of your working space. Whether you want to print a digitally produced image, or portray key messages related to your business, BioClad can make it happen. As well as adding vibrancy to your working environment, PhotoClad does not harm the antimicrobial qualities of your hygienic cladding solution, meaning you can rest assured that your environment is as safe as possible as well as incredibly stylish. For more information about our digital printing service, including a range of colours and finishes, read our PhotoClad product page. PhotoClad was used at Croxteth Primary School to portray key messages and values to help motivate the generations of the future for many years to come. Thanks to BioClad’s hygienic cladding solution, 350 staff and students are now working in a safer and more bespoke environment. We understand how important maintaining a hygienic environment is for healthcare institutions. Our IPS units were installed at Jeddah Maternity and Children’s Hospital to uphold a fully hygienic environment for nurses and patients alike. In addition to this, PhotoClad was installed to uphold an aesthetically pleasing colour and finish to the hospital. Installing a hygienic cladding solution for your property doesn’t mean that your space has to be devoid of colour and life. By investing in an antimicrobial cladding solution, and taking advantage of PhotoClad, you will be able to uphold a fully hygienic environment with a personal finish to match. Our hygienic cladding solutions have been tested to kill microbes by up to 99.9% in just two hours. For more information on how we can help your business, contact us today!